What is the Impact of Uber, Homejoy and Others on the Transportation and Housekeeping Industries? This post was co-authored by Boris Vassilev, a data scientist at Scripted.com. No doubt 2014 is a great year to be a smartphone owner. You have an endless array of options at your fingertips for any service imaginable. If you want to hail a ride from San Francisco to Oakland, you can use Uber, Sidecar or Lyft. If you want to ship a package, you can use services like Postmates, Shyp and others. You can have fresh food delivered to your home, your laundry done and a hotel reservation completed all by hitting a few buttons. But what has the advent of these services done to established industries? Has the rise of these companies come at the expense of honest working folks who play by the rules and don't skirt regulatory issues to get ahead? 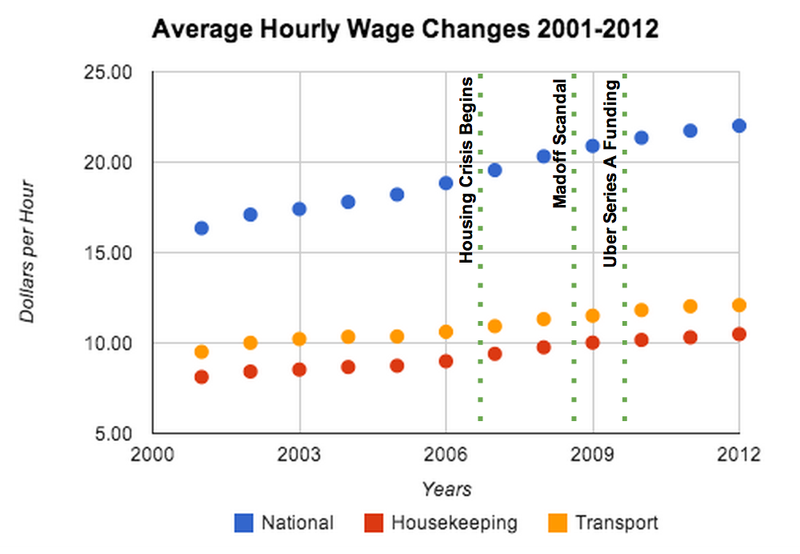 We decided to take a look at two industries in particular: transportation and housekeeping (which broadly encompasses handiwork, babysitting and housecleaning), to see what the macro effect looks like. We chose transportation and housekeeping because they're well-established, venture capitalists have invested a lot of money in both spaces and gigantic tech businesses are being built within each vertical. By way of background, we work at Scripted.com, which is a company that helps businesses create written content through our network of U.S.-based freelance writers. We watch the trends in our industry -- the freelance marketplace -- and other industries very closely, and consider them an analog for our own business. What we found was the transportation and housekeeping industries were in a recession long before tech entered the picture. 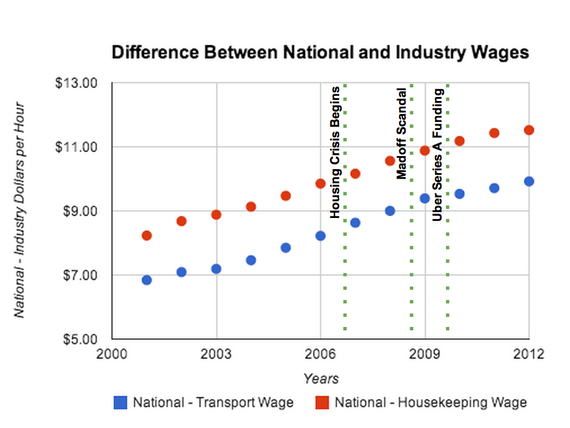 We looked at Bureau of Labor Statistics data over a 10-year period to see how wages within the transportation and housekeeping industries performed against the national averages, as you can see in the two graphs below. 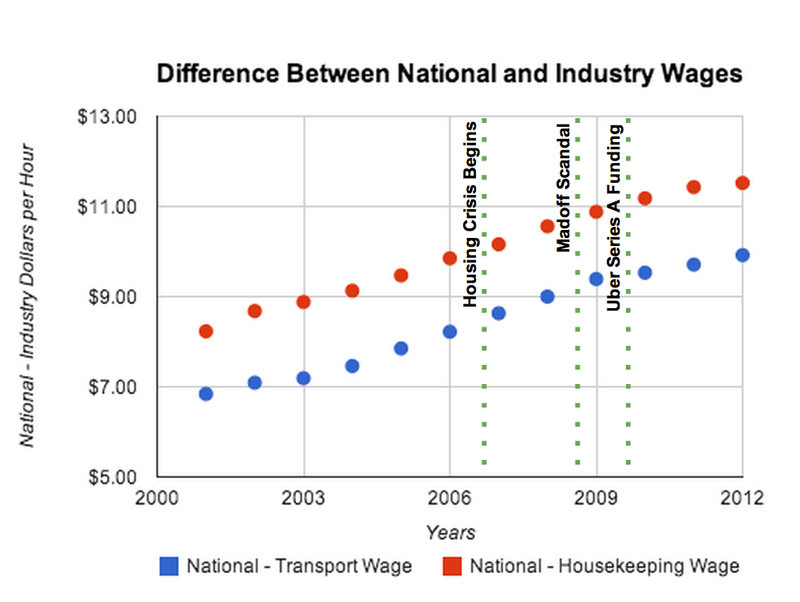 In the graph below, we can track the progress of both national and industry-specific wages over the previous decade. The growing gap between the national and industry-specific wages grows even clearer in the difference chart below. 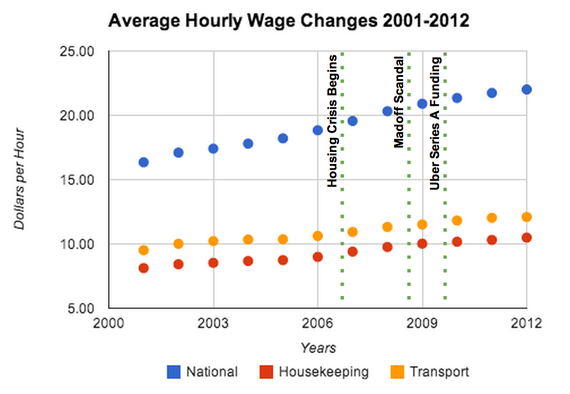 The average national wage (whose natural growth has lagged behind inflation since the late 2000's economic crisis) increase far outpaces the wage growth for both the housekeeping and the transport industries. The size of the wage growth gap started accelerating in the early 2000's, and has been increasing steadily ever since. This difference appears unaffected by the market crash and was present long before smartphones -- the preferred medium for many new tech companies -- received massive adoption, and therefore long before Uber, Homejoy and other services like these existed. The workers in transportation and housekeeping have been faced with decreasing work prospects for longer than the past decade. Why Were These Industries in Decline? We can only speculate as to why the industries were already in decline, but it's probably the reason entrepreneurs and venture capital started to enter the fray. The transportation industry is heavily regulated, and its fate is often tied to political interests. Limitations on the number of active taxis in large city centers and the rising cost of medallions, which forced most taxi operators to lease their vehicles instead of working directly for themselves, didn't help matters. In New York City, the bidding cost for a pair of cab medallions increased sevenfold, from $350,000 to $1.3 million, between 2004 and the latest auction. Cities take a large cut of medallion costs, something they are interested in maintaining, but which even further truncates growth. In San Francisco, the city allows the transfer of a taxi medallion between individual owners to the tune of $300,000 with a fee of $100,000 taken directly from the price and deposited into the city's purse. These are just a handful of many regulations within established industries that made it possible for businesses like Uber and Lyft to gain a lot of traction. The same can be said for the housekeeping industry, which is also heavily regulated in the state of California and elsewhere. The combination of fragmented supply, plus heavy regulation, may be two of the reasons we are seeing a lot of entrepreneurs build solutions in these spaces. The top housekeeping tech companies have received hundreds of millions of dollars over the past few years (including the IPO of Care.com), and the top handful of transportation companies have netted near a quarter of a billion dollars. Single players like Uber and Lyft have amassed over $250 million each to build their businesses. Idealistically, what these companies strive to do is to "grow the pie" and make it possible for more people to make more money. On the flipside, many argue that this comes at the expense of people who have been doing things "by the book" for a long time. What Does This Mean for the Future of Established Industries? Industries that are heavily regulated, with fragmented supply, are going to face significant pressure from competitors that are looking to move fast. That being said, these new tech companies are not anywhere close to supplanting established industries. Traditional companies continue to grow, but the rapid expansion of this new breed of technological competitor will force traditional companies to adapt in order to maintain competitiveness. Ultimately, this is great for customers, and potentially great for people who work in these industries. Boris Vassilev is a data scientist at Scripted.com, a leading provider of high-quality, original written content. Boris graduated from Columbia University and enjoys travel, science fiction and rock climbing.